Dragon’s Domain Records, to be distributed by BuySoundtrax Records, will be releasing THE UNTOUCHABLES, featuring music composed by Joel Goldsmith (STARGATE UNIVERSE, STARGATE ATLANTIS, STARGATE SG-1) for the 1993 television series developed and produced by Christopher Crowe, starring Tom Amandes as Elliot Ness, John Haymes Newton, David James Elliot, Michael Horse, John Rhys-Davies, Nancy Everhard, Valentino Cimo, Paul Regina and William Forsythe as Al Capone. THE UNTOUCHABLES was officially based on the classic 1959 TV series that had starred Robert Stack as Federal Agent Eliot Ness, although the influence of Brian De Palma’s 1987 feature film version was also very much in evidence. The series premiered on January 11th and lasted two seasons, broadcast on Paramount’s UPN television network from 1993 to 1994. THE UNTOUCHABLES was created and developed by Christopher Crowe, who wrote nearly all of the series episodes. Crowe had been an executive producer on the revived ALFRED HITCHCOCK PRESENTS in 1985 and had co-written, with Michael Mann, the screenplay for Mann’s LAST OF THE MOHICANS (1992) in addition to writing and directing the mystery thriller WHISPERS IN THE DARK (1992). THE UNTOUCHABLES focused on Ness and his fellow officers’ attempts to quash the ruthless crime wave of Al Capone in Prohibition-era Chicago; their team is designated “untouchable” because they couldn’t be bribed or intimidated by the mob. Crowe’s vision for the series, unlike the original TV show or the De Palma feature film, was to stick to a historically correct portrayal of Chicago in the 1930s. The series was filmed on location in Chicago, with additional expenses incurred for vintage vehicles and complicated stunts and action sequences. Joel’s journey to THE UNTOUCHABLES began when he scored a short-lived TV series called H.E.L.P. in 1990. His father Jerry Goldsmith was hired to compose the series theme and his agent Richard Kraft suggested Joel write the underscore for the pilot. The producers agreed and when the pilot went to series, Joel wound up scoring that as well. The same situation occurred again with the TV Western, BROTHERHOOD OF THE GUN (1991; aka HOLLISTER), which was made by the same producing team; Jerry wrote the theme and Joel wrote the score for the movie. Later, when the same team came together to launch THE UNTOUCHABLES, discussion was again held to have Jerry write the series’ theme and Joel compose the episode music. But Jerry’s schedule turned out to be too busy and he could not become involved in the show. The producers offered the show to Joel, who ultimately composed all 42 episodes of THE UNTOUCHABLES. Joel’s theme turned out to be one of the best of his career. As it turned out, Jerry came in to conduct the orchestra for the main title, as well as a few cues in the pilot. Since his first cinematic composition, a collaboration with then-newcomer Richard Band on the low-budget science fiction thriller, LASERBLAST (1978), Joel scored a number of feature and television films throughout the 1980s and ‘90s, including the sci-fi series SUPER FORCE (1990), Roland Emmerich’s early sci-fi thriller MOON 44 (1990), and Jim Wynorski’s gentle family comedy, LITTLE MISS MILLIONS (1993). After THE UNTOUCHABLES, Joel went on to score the TV series HAWKEYE (1994), BAD BLOOD (1994, aka VIPER), Jim Wynorski’s VAMPIRELLA (1996), KULL THE CONQUEROR (1997), TV’s WITCHBLADE (2000), HELEN OF TROY and several iterations of the STARGATE TV series (1997-2011). He also provided synthesized sound effects for STAR TREK: THE MOTION PICTURE (1979) and composed additional music for STAR TREK: FIRST CONTACT (1996). Tragically, Joel passed away at the age of 54 on April 29, 2012, from cancer. 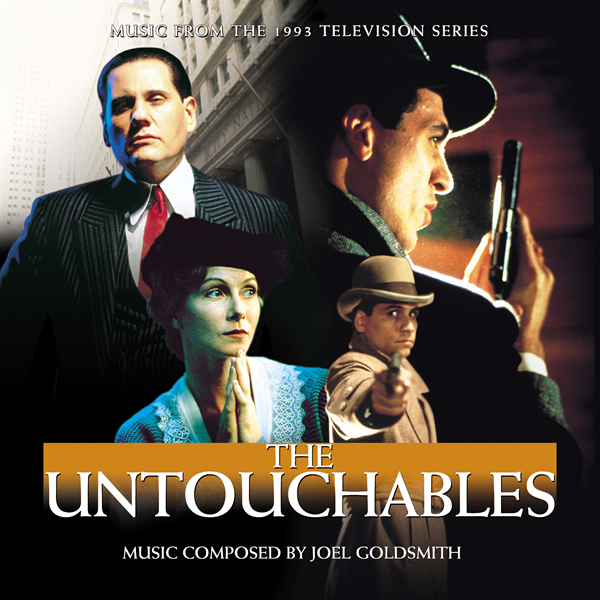 Dragon’s Domain Records, to be distributed by BuySoundtrax Records, presents the world premiere release of Joel Goldsmith’s music for THE UNTOUCHABLES, mastered by James Nelson at Digital Outland. The booklet contains liner notes written by author Randall Larson. THE UNTOUCHABLES is presented on 2 CDs. The first disc contains music from the pilot episode, and thus contains the richer sound of the full orchestra. Music from fourteen selected episodes from Seasons 1 and 2 occupy the second CD, while different versions of the main title theme bookend each disc. Fans of the composer will find much to enjoy on these two discs. THE UNTOUCHABLES is a limited edition of 1000 units.